As part of Harbour Station's multi purpose facility design, the ability to transform the arena into a showcase for products and services is one of our greatest assets. To transform a typical ice surface of less than 17,000 square feet to a flat area of just under 60,000 square feet is a big task. To "gut" the arena takes 15 workers approximately 8 hours. A typical conversion would be as follows. Commencing in the late evening, the ice plant will be shut down and the floor heated. While this is happening, the hockey glass will be removed from the tops of the dasher boards. This is tempered glass and the larger end zone sheets weigh 400 pound apiece. A forklift and suction cups are used for this process. Other workers are lowering the folding seats and folding up the retractable bleachers. These bleachers will then be wheeled away to storage. About 2 hours after the ice plant is off, the concrete will reach about plus 3 Celsius. At this point the ice will de-bond from the concrete but, being over an inch thick, will still be in ice form. A loader will then pile all this ice up and then transfer it to a dump truck for removal from the arena. A large rubber squeegee is then installed on a forklift and all melted ice and paint will be pushed to a drain. 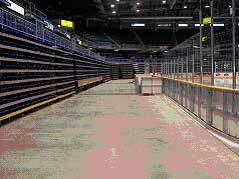 At this point the dasher boards, player and penalty benches are removed and put on carts for storage. By early morning the area is free of seats, ice, dashers and glass for the Trade Show staff to commence setting up their curtains and carpets. On most occasions the ice is required to be back in a day or so after the trade show moves out. In this situation the ice plant is started during the end of the last show day and by the time all the booths and decorations are off the floor we are very close to being ready to start making ice. The procedure then just reverses and 40 hours later Harbour Station will be ready for hockey.